Innovative Restaurent !! | K n o w M o r e . . .
Bad news for rude waiters! A new and innovative restaurant (S Baggers) in Nuremberg, Germany has replaced the waiters and waitresses with a high-tech automated computer system, which aimed to improve the service and attract the most attention as dubbed as world’s first automated restaurant. As you see in the photo, you can order your favorite meals through the touch screen display that installed on your table. In addition, this amazing automated system also calculates the likely delivery times for your meal and then delivered to you via a spiral slide. “The system is the only one of its kind,” said Michael Mack, the restaurant’s owner. “The concept will revolutionize the food industry.” It’s a cool idea! 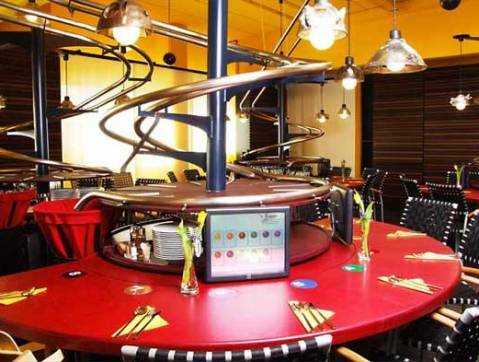 Now, you can say goodbye to those rude waiters with having your meal in automated restaurant. Get help or contribute tips or tricks at My Digital Life Forums.